2015 saw the ten-year anniversary of the Asahi Shimbun Displays at the British Museum. In this blog post Laura Purseglove and David Francis engage in a critical dialogue about the Asahi Shimbun Displays and the relationship to trends within museological and cultural theory. 2015 saw the ten-year anniversary of the Asahi Shimbun Displays at the British Museum. Located in Room 3, to the right of the main entrance, these displays have provided the opportunity to focus in depth on individual objects within the Museum’s collection. They were also conceived of as an experimental space, where the Museum could explore new methods of displaying and interpreting objects. Channelling this experimental spirit, members of the project team, Laura Purseglove and David Francis, engage in a critical dialogue in this blog post about the Asahi Shimbun Displays and the relationship to trends within museological and cultural theory. DF: One of the most innovative things about the Asahi Shimbun Displays has been the opportunity to tell stories about individual objects, which we wouldn’t have the space for in the permanent galleries. In Room 70, the Roman Empire gallery, the Meroë head of Augustus is one of hundreds of objects and there is only scope to present the head as an example of Roman portraiture and tell the story of Augustus’ rise to power. DF: For The Meroë Head of Augustus: Africa defies Rome (2014) display, we were able to go into much more depth. This display explored Rome’s relationship with the African kingdom of Meroë and the story of the object’s discovery in the build-up to the First World War. It even made comparisons between the beheading of Augustus’ statue and the toppling of a statue of Saddam Hussein in Firdos Square in Iraq in 2003. In many ways this use of a single object to tell a wider historical narrative can be seen as a precursor to the A History of the World in 100 objects series broadcast on Radio 4 in 2010. That in turn has popularised an object-based approach to history – now objects are used to tell the story of lots of things, from baseball to Doctor Who. LP: Yes, from a fine art perspective, which is my area of expertise, it’s been interesting to see this renewed focus on objects, as opposed to context, in humanities scholarship and in our museums and galleries. You might say that the first display in 2005, Made in Africa, reflected this idea by consciously aestheticising three stone hand axes, encouraging visitors to engage directly with the objects’ physical properties rather than seeing them as illustrative of a wider historical context. The hand axes themselves were presented as things to be experienced rather than ‘read’. This approach is mirrored in cultural theory, for instance in the ideas of philosopher Gilles Deleuze, who used the term ‘affect’ to frame the art object as a bundle of ‘sensations’ activated when perceived. DF: In archaeology and anthropology as well, you have what’s known as ‘the material turn’ – a focus on a thing’s materiality as opposed to treating objects as ‘texts’ to be read. I’m an interpretation officer and so my focus is very much on an object’s relationship to text. This involves creating accessible text for a non-specialist audience, and also using objects to construct narratives about the past that allow us to better understand the present. At the same time, there are some things text alone cannot capture. The display Akan drum: the drummer is calling me (2010) told the story of the oldest African-American object in the Museum. Made in West Africa and collected in Virginia, this leather drum was brought to America as part of the transatlantic trade in enslaved Africans. As well as interrogating the terrible practices of the slave trade the display also looked at the transmission of musical heritage from Africa to America. We created an accompanying soundtrack, tracing early African drumming to the development of call and response and gospel music, and its development into jazz, blues, RnB and hip-hop. If you were to tell that story through text alone so much would be lost. LP: Right, by not relying solely on text to explain an object we acknowledge that objects can’t necessarily be reduced to their more ‘textual’ properties, they are more than the sum of their parts. For the display Xu Bing: Background Story 7 (2011) we experimented with a white cube display style, which privileges experiencing the object over explanation. The design encouraged viewers to encounter the object directly, with text positioned to the side so as not to interfere. The back of the installation revealed the materials Xu Bing used to create the illusion of a traditional Chinese scroll painting – debris and plant materials. We relied on the power of the object to draw visitors to the back of the screen. Signposting, on that occasion, would have detracted from the experience of encountering the work in an unmediated way. DF: You mentioned using a white cube approach and I think it’s interesting how different disciplines have their own styles of display. If you think about the one object in a room approach, it can be seen as rooted in the tradition of the modernist art gallery. Although I suppose it has its origins in the treasuries of the medieval church, setting aside a relic or icon to be encountered and venerated. However, such an approach can limit the meanings of an object, especially when it’s entangled within a wider network, or assemblage of objects. DF: Since the publication of Edmund de Waals’ The Hare with the Amber Eyes, netsuke have been popularly conceived as object d’art – tiny, beautiful things to be collected and aestheticised. But this is only one aspect of their story. They’re also part of a network of objects designed to provide a specific function. Japanese kimonos have no pockets and so, in the Edo Period, small personal items – such as tobacco or money – would be carried in a small pouch. Netsuke were used as toggles that allowed these pouches to be hung from the belt of the kimono. It is only by displaying the netsuke alongside a kimono and other accompanying male accessories that you can really understand their purpose, as well as appreciate their aesthetic qualities and idiosyncratic personalities. LP: Yes, the example of the Dressed to impress: netsuke and Japanese men’s fashion (2014) display does point to the limits of the single object, unmediated approach. It’s an example which demonstrates that sometimes objects need to be understood through their relation to other objects, but also that sometimes their meaning lies in their relationship with people. LP: The Sikh Fortress Turban (2011) display presented a dastaar boonga turban as an example of a living tradition. It was co-curated by members of the Sikh community in London and placed their voices and experiences at the centre of the story. 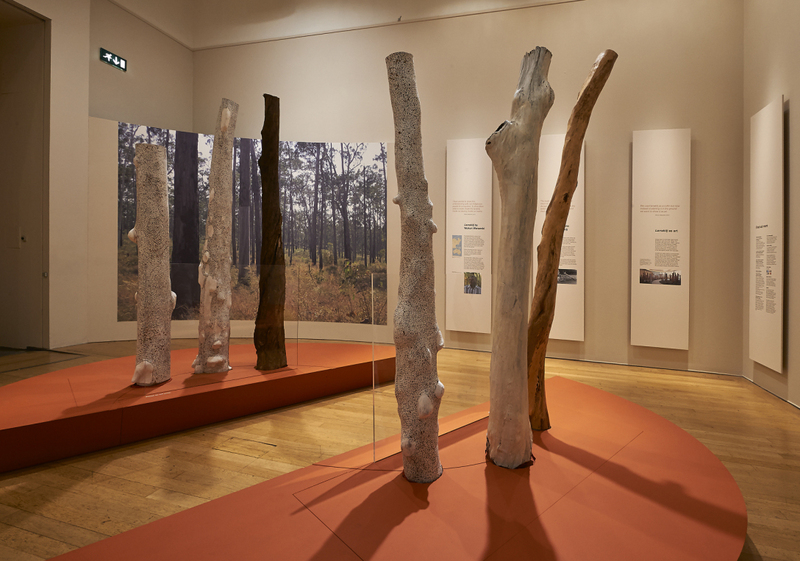 More recently, the Larrakitj: Aboriginal memorial poles by Wukun Wanambi (2015) display, an installation by the indigenous Australian artist, defined the piece in terms of its relationship to the artist and his cultural heritage. A short film showing the artist talking about the work demonstrated that what makes the piece so special is its connection to the artist’s personal and clan histories, as well as the relationship to the landscape of Arnhem Land. But, that said, visitors could still enjoy the beauty and craftsmanship inherent in the work without watching the film. So perhaps this leaves us in agreement; the Asahi Shimbun Displays are at their best when they reveal the ways in which our objects connect to the wider world but don’t reduce them to mirrors of their contexts. It’s the beautiful, strange, sometimes baffling nature of ‘things’ that makes us want to visit museums, isn’t it? The Asahi Shimbun Display Scanning Sobek: mummy of the crocodile god is on display in Room 3 at the British Museum until 21 February 2016. Supported by The Asahi Shimbun.